For those of you who live nearby and thought that we dodged that snowstorm (Up to 8 inches! Strong winds! Blowing and drifting!) on Sunday through either luck, meteorological error, or maybe even the pity of Mother Nature herself—I’ve got news for you. You have my husband to thank. Because we now have one of these in our garage. After 15 winters together, shoveling, getting stuck in the driveway, and nursing sore shoulders, Husband decided that enough was enough. This was after he he got home at 1:00 AM Saturday morning after hanging out with friends after the state wrestling tournament, pulled into the driveway—and got hung up on the snow at the end of the driveway so thoughtfully piled there by a passing snowplow. I had been asleep for about 2 hours when he came into the bedroom, flipped on the light, and announced that I’d have to help dig him out. My eyes popped open as suddenly I had flashbacks from my childhood, although instead of sitting in a car, flooring the gas as Husband pushes until his veins pop out of his temples, I was standing in the middle of a gravel road in my nightgown yelling “Hyaah!” at cows as they attempted to trample me. As luck would have it, we snagged the last snowblower in our city, one that had been put back for a woman who was supposed to pick it up an hour earlier. You snooze, you lose! And as we were driving home, Husband said, “You know what’s gonna happen now that we bought this? It won’t snow again this winter.” So far, he’s been right. We managed to avoid an impending snowstorm the next day, and we have yet to see any measurable snowfall since. Which is okay with me. If that’s all it takes for this awful winter to be over, we’ll make the sacrifice. Snowblower from Yard Machine. Table from Pottery Barn. No one paid me or gave me anything free to use these. Although I’d totally take the table. Oh, how funny! 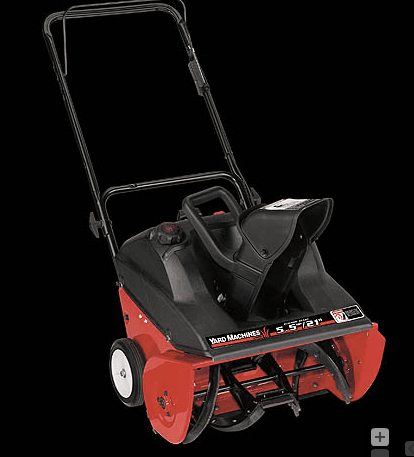 We spent Saturday morning wandering the aisles in Mendard’s, Lowe’s and Home Depot ad my hubby was considering buying a not-to-be-found snow blower. Instead of finding one, I did pick up several booklets on new patio furniture. We have TWO snow blowers and I am STILL waiting for one of those buggers to make it STOP SNOWING. .-= Jenni´s last blog ..The Real Game of Life =-. If only you would have bought it earlier, you could have saved the whole area a lot of grief. @IASoupMama, I’m not sure who is doing the ordering and buying for these stores, but they evidently live in Florida or something! 🙂 Wanna borrow our snowblower? So where did you eat? Just curious. I’m starting to think we should just lay down a picnic blanket every day. Much cheaper!